VIVa Warriors has moved to Electric Brixton following its sold-out party at FIRE in Vauxhall earlier this year. 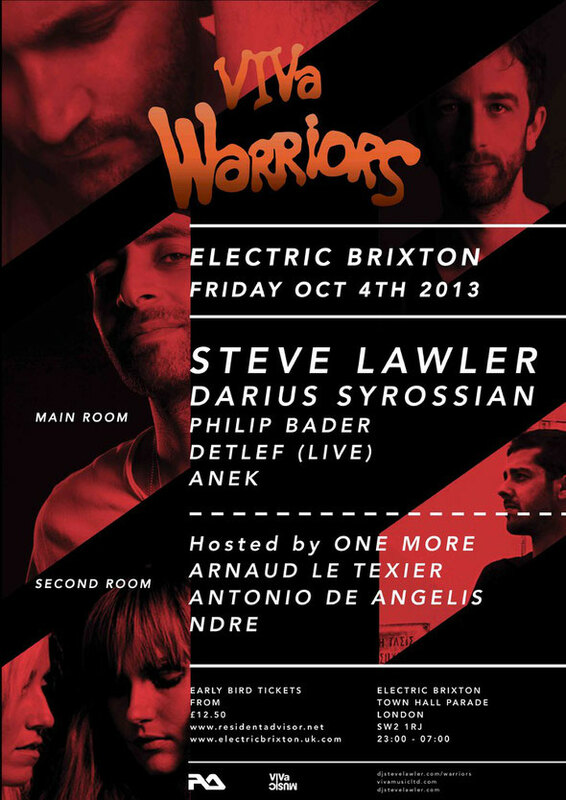 The London event on Friday 4 October 2013 sees Steve Lawler joined by his VIVa MUSiC artists and Warriors residents from Sankey's Ibiza; Darius Syrossian, Philip Bader, Detlef and Anëk. London promoter and VIVa friends One More are to host the second room with their artists Arnaud, Antonio De Angelis and NDRE. VIVa Warriors' second season at Sankeys Ibiza is coming to a close on September 29th, and Steve Lawler's decision to move the party to the Sunday night for 2013 season seems to have been the right one. Each week VIVa Warriors, which includes Lawler himself, a selection of VIVa residents and guests that included Robert Dietz, Steve Bug, Guti, Todd Terry, Livio & Roby, Radio Slave and Lee Curtiss witnessed a great night as they left their own stamp of music individuality. This autumn and winter period for 2013-2014 sees Steve Lawler and his Warriors visit many countries, including numerous dates in the UK, The Netherlands, Spain, Italy, USA and more.Started in October 2006 by Steve Lawler, VIVa MUSiC began life as a music label and became a hotbed for new talent, developing the careers of Audiofly, Livio & Roby, LEON, Simon Baker and Julian Perez. Electric Brixton is fast attracting London’s clubbing crowd with huge parties from Carl Cox, Loco Dice, Gilles Petersen, Kissy Sellout, Bugged Out, and Underground Resistance, plus more. The venue, formerly The Fridge, was fully restored, refurbished and launched in September 2011 as a music venue, hosting club events at weekends.